Using real-time radio-frequency spectrum analysis a bug signal hiding within another signal becomes visible to us. Radio-Frequency Spectrum Analysis is a vital element of our inspection process. Many eavesdropping devices transmit audio, video and data information via radio waves. Radio-Frequency Spectrum Analysis is the quickest way to detect their transmissions. Although only the most sensitive areas are designated for a full inspection, Radio-Frequency Spectrum Analysis can detect bugging devices anywhere within these immediate areas. Makes perfect sense. Our analysis takes place closer to the bug than the person receiving its transmissions. The signal has to pass by us first. The trick is to have the proper instrumentation to catch the signal. Murray Associates provides Technical Surveillance Countermeasures and eavesdropping detection using real-time RF spectrum analysis, an advanced TSCM technology. Our refined search Radio-Frequency Spectrum Analysis protocol is used to discover these radio-frequency emissions. We comb the entire RF spectrum with custom designed, government-level surveillance receivers, and process these signals in real-time. 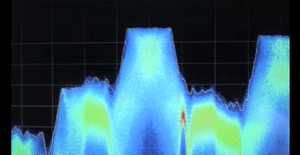 Final result… even the most sophisticated audio / data / video transmissions by bugs are revealed. This level of Radio-Frequency Spectrum Analysis testing is extremely effective, but very rare outside official circles, and seldom used by many other companies that provide TSCM services. This is due to high cost of the instrumentation and the technical skills required to use it. (Case History) Simply put, even if someone can afford the equipment to discover bugs using real-time RF spectrum analysis, odds are they don’t really know how to use it. It takes years of experience to recognize all the signal types, frequency allocations, and how to effectively us a radio-frequency spectrum analyzer. With our Portable Radio-Reconnaissance Spectrum Analysis™ receivers we easily handle the demands of travel security, too. Have a Question About TSCM? If you have any questions about the Spectrum Analysis or the TSCM services provided by Murray Associates, simply fill out the form below, or call us from a safe area and phone. If you think you are under active electronic surveillance, or believe you have discovered a bug or covert video camera, go to our Emergency TSCM page. The procedural checklist there will tell you exactly what you need to do next.